My journey towards becoming an Intelligent Horsemanship Recommended Trainer divided into 3 stages. I started by completing the courses below and sitting exams in each of them, which led to me becoming a holder of The Monty Roberts Preliminary Certificate of Horsemanship (MRPCH). The MRPCH can only be obtained through the Intelligent Horsemanship Society, which was founded by former European Champion lady jockey, Kelly Marks, the only qualifed teacher and holder of the Monty Roberts Advanced Professional Certificate. 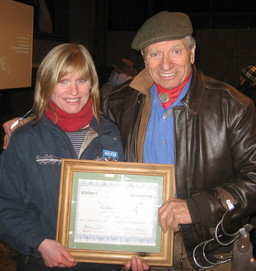 All the courses and certificates are fully endorsed by Monty Roberts himself. This course not only looks into how to approach `problems with horses', but looks at some of the many common ways that these problems may have evolved. Quite often this can be due to a misunderstanding of the horses' language and therefore creates a poor communication between the horse and owner. Part of the course is devoted to studying and discussing actual case studies and outcomes. as well as studying how horses learn and understanding horse senses. This course is taught by Ian Vandenberghe, former college equine lecturer and stud manager, with over 22 years of experience of stud work including foaling over 600 mares. 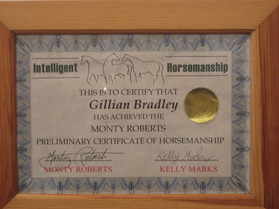 Ian has worked very closely with Monty Roberts who along with Kelly Marks, fully endorses his courses. This course is also run by Ian Vandenberghe and explores and teaches the correct and humane way of handling young foals. This course is run by Kelly Marks and is mainly practical based. During these 5 days you gain practical experience in learning how to achieve `Join up' and `Follow up', with a horse as well as putting on the first saddle of a horse's life, and lessons on long lining and leading. Lectures and demonstrations in preparing your horse for the farrier, loading and saddle fitting are also included on the course. This meant that I had to complete and submit a minimum of 10 join ups. I did about 22 in all and chose my best 10 to submit, including videos of me doing a basic join up with a horse and then a video of me doing a full join up with tack, and putting a rider up on the horse for the first time. As well as this I then had to include in my video work a `leading the less easy horse' session, which included showing how I approached leading a tricky horse successfully over tarpauline and then through L shaped poles as well as training the horse to lead beautifully! Thankfully my videos were successfull and I was then invited to sit the Stage 2 exam week. This was a rather intensive but yet fun week at the same time! I had to sit exams in all of the courses listed above and take a practical exam showing a full join up with tack and my long lining skills. I also had to submit research papers that were set on specific topics from each of Ian Vandenberghe's courses. As part of the stage 2 requirements I had to undertake a Psychology Project which I then presented as a power point presentation during the exam week. The aim behind these projects is to present useful insights and observations. As of 2008 with the help of Dr. Veronica Fowler, the projects have become more scientifically correct in their methodology, presentation and analysis, with the aim to have several published in relevant journals as papers. The first of such projects are currently undergoing peer review. My project was about whether music could be used to lower the heart rate of a horse in a stressful situation. The full project can be viewed alongside many other interesting projects at the Intelligent Horsemanship website under the IH research section, but you do need to be a member (£20 a year) to access that particular section. This intermediate course which I also completed, covers all the common problems and solutions associated with loading and travelling horses. The course includes lots of hands on practical experience of loading difficult horses. This involved working with lots of real life case studies, writing them up and also including video footage, all of which was then thoroughly examined by Kelly Marks and Sandra Williams. So whatever difficulties you may be experiencing with your horse or pony then I would love to help. I can help you find a positive way forwards for you to develop a successful, willing, understanding and trusting relationship with your equine partner.